front L-R: Tim Payne (CDAA Instructor), Ken Murrey, Steve Saville. Diving in caves has certain inherent risks: remoteness of sites, no direct access to the surface and the adversity of the water environment in terms of temperature, flow & depth. All cave divers grapple with these challenges and the training available provides methods to manage these issues. One method for approaching the concerns that arise when diving in overhead environments is to consider the “what if” situations that may occur as a result of the dive you are planning. Often the “what ifs” have a readymade solution in technical diving, for example: Question – what if you have a gas loss: Answer – follow the rule of thirds, stage bailout gases, consider gas sharing in the team etc. Of course some “what ifs” are outside the scope of a readymade solution and require pre planning, further training and increased logistical capabilities. One of these “what ifs” in cave diving is what to do if a diver is injured deep in a cave and is unable to self-rescue. Such considerations preoccupy cave divers and expedition teams when planning and making cave dives. The process of answering these questions is both highly educational in terms of skills, techniques and equipment; and also extremely sobering in terms of the logistics required to successfully rescue an injured diver and the likelihood of that rescue being successful. It’s for that reason that PADI Asia Pacific Technical Diving Division (TDD) Consultants Thomas Knedlik and Alex Boulton recently completed the Sump Rescue & Recovery Orientation Program (SROP) in Mount Gambier, South Australia run by Dr Richard Harris and the Cave Divers Association of Australia (CDAA). The two day program had both a theory and practical component. Theory covered a variety of topics including regional, national & international information regarding cave rescue authorities, self-rescue options, Incident Command Systems, initial search & response teams, communications, first aid, sump rescue, stretcher use and an exercise involving a complex sump rescue. The practical part involved searching for a cave diver, recovery of a deceased diver and finally moved on to a full exercise that involved a remote sump rescue. The rescue efforts began from scratch incorporating what was learnt on the previous day and started with establishing a management system in response to information that a diver was injured and located in an air chamber deep in a remote cave. The team then had to find the diver, assess the diver, communicate with the Incident Command, stabilise the diver and then determine and implement the “safe” evacuation of the diver. 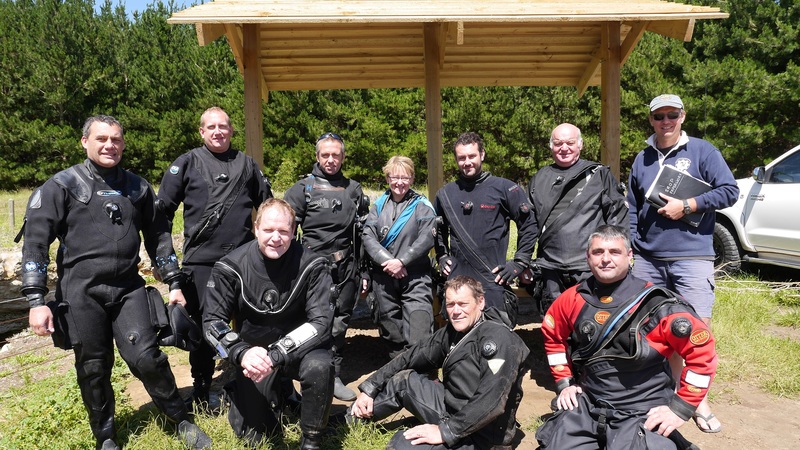 Participating in this program was a revelation in terms of the real concerns of all types of cave diving whether remote or otherwise, particularly in terms of the consequences of an injury that incapacitates a cave diver so self-rescue is not an option. I’d recommend all cave divers consider such training for pre planning, self-preservation and to be better equipped to render assistance. Photo courtesy of Steve Saville.